My original intention had been to try and cleverly weave our 2 weeks in Scotland around some great walking, biking and running, concluding with the Ben race. This didn't work out as we needed to be back before that weekend. 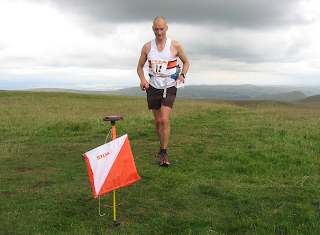 So i looked for a race and found the Ochil 2000s. An AL race of 20 miles and 5000". That seemed to fit the bill. Have had a nightmare at Borrowdale a few weeks earlier I needed a fresh approach. I set off very slowly, probably at the sort of speed I'd start a long training run. Absolutely no push at all on a day of sunshine and nice views. Having never stepped onto these hills before in my life and this being a navigation race I wanted to keep a certain focus, I certainly didn't want to follow anyone else, unless........ unless my earlier planned route needed quickly amending, as they sometimes do. I won't detail all the hills we crossed but I did pick up places steadily and for the most part got the navigation spot on, on two occasions making up quite a few places with she contouring. In the last 4 or 5 miles, with rain now falling, its fair to see I was going pretty much flat out to make up and defend places. I came in an hour behind Murray Stain and over half an hour behind Yasmin Paris. I was 27th out of 76, to be fair as a counter in a Scottish GP it had a class field at the top. Did I enjoy it? Certainly. I was happy with my performance, boosting my badly dented confidence. However, I probably wouldn't make the long journey for a very pennine like race.